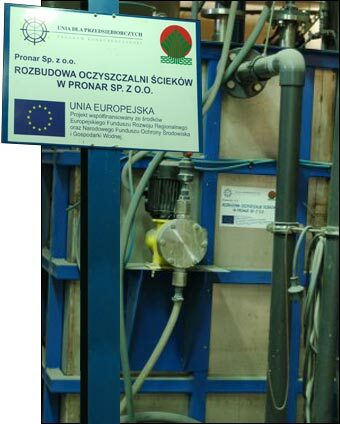 European Union Projects - Pronar Sp. z o.o. On January 11th, 2013 the agreement with the Marshal’s Office to co-finance the project “Development of Pronar Ltd. company, Narew by design and execution on its own for axis performance test” within the Regional Operational Programme of Podlasie Province for the period 2010-2013 was signed. The Pronar’s project was selected for funding within the activity 1.1 Creating conditions for development and innovation. On May 24th, 2014 the Appendix No. 1 to the grant agreement No. UDA-RPPD.01.01.00-20-013 / 12-00 was signed. On February 27th, 2015 the Appendix No. 2 to the grant agreement No. UDA-RPPD.01.01.00-20-013 / 12-00 was signed. Construction and equipping of the Research & Development Centre of Pronar Ltd. company. On December 28th, 2012 we signed a contract for financing the project named “Construction and equipping of the Research & Development Centre of Pronar Ltd. company” in the framework of the sub-activity 4.5.2 Support for investment in the modern services sector, the activity 4.5 Support for investments of high importance for the economy, the priority axis 4 Investments in innovative ventures of the Operational Programme Innovative Economy, 2007-2013. On February 3rd, 2014 the Appendix No. 1 to the grant agreement No. POIG. 04.05.02-00-099/12-00 dated on December 28th, 2012 was signed. On September 5th, 2014 the Appendix No. 2 to the grant agreement No. POIG. 04.05.02-00-099/12-00 dated on December 28th, 2012 was signed. On December 18th, 2014 the Appendix No. 2 to the grant agreement No. POIG. 04.05.02-00-099/12-00 dated on December 28th, 2012 was signed. On March 3rd, 2015 the Appendix No. 2 to the grant agreement No. POIG. 04.05.02-00-099/12-00 dated on December 28th, 2012 was signed. Project duration:Feb 1st, 2012 – Apr 30th, 2013. 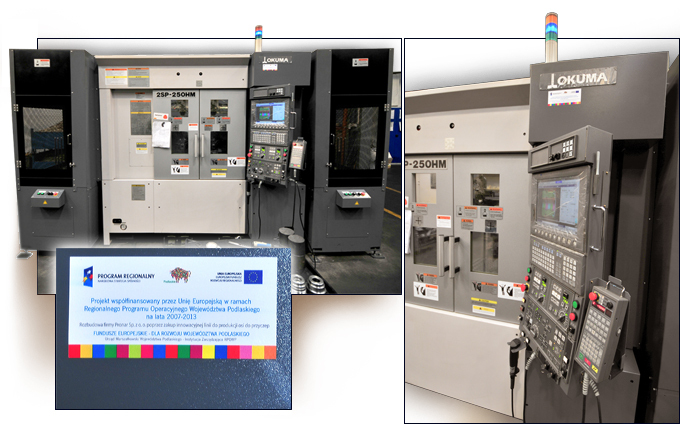 The aim of the project:completion of Pronar workers’ practical knowledge (sales persons, engineers, masters, operators, welders and planners). The target group of the project is 290 employees of Pronar Ltd. company, Narew. 1. Soft training: Sales techniques and trade negotiations. 2. Soft training: Human Resource Management. 3. Soft training: Project Management. 4. Soft training: Production Management. 5. Vocational training: MIG / MAG Welder. 6. Vocational training: TIG Welder. 7. Vocational training: Fork lift truck driver. 8. Vocational training: Operator of a crane controlled from the working level. 9. 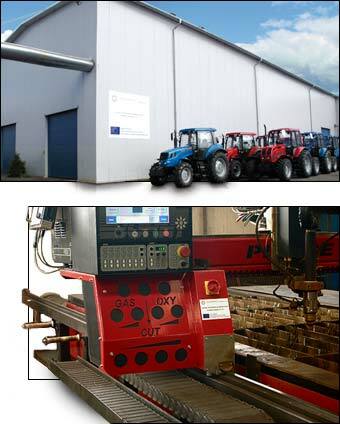 Vocational training: Operator of CNC machine tools. The project is implemented by Tomas Consulting company located at Aleja 1000-lecia Państwa Polskiego 39A, Bialystok. The project is co-financed by the European Union within the European Social Fund, Operational Programme Human Capital. 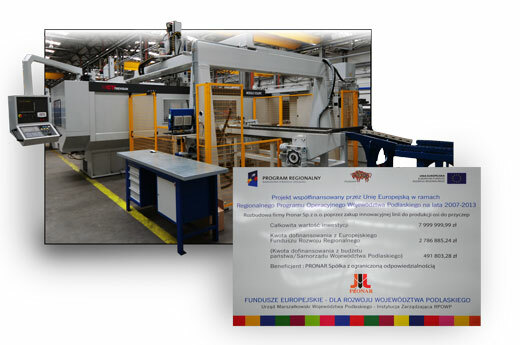 On December 29th, 2010 an agreement with the Marshal Office on project financing “Expansion of Pronar Ltd. company by purchasing an innovative production line for trailer axles” within the Regional Operational Programme for Podlasie Province for the period 2010-2013 was signed. The Pronar’s project was selected for funding within the activity 1.4 Support for business investment.